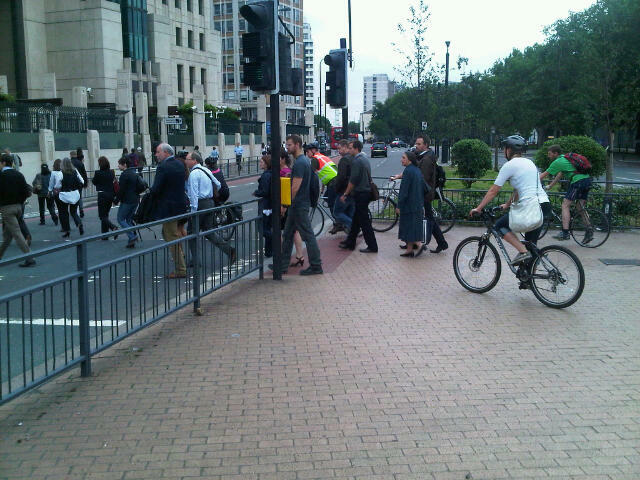 Last weekend hundreds of Londoners took to their bikes and cycled through London to protest for safer roads. The turnout was amazing. I've written my review of the ride here and ibikelondon has masses of pictures and a fabulous description on his site here. Today, the Evening Standard reported: "There has been a growing sense among cyclists over the past few months that the Mayor's cycling revolution is running out of road." On Saturday, former conservative mayoral candidate and board member of Transport for London Steven Norris presented a programme on LBC radio where he rejected the Mayor's suggestion that the Elephant was 'just fine' to cycle around provided 'you keep your wits about you' and made clear that "the Elephant is clearly not safe enough...the one thing that puts people off cycling is that they say 'it's not safe enough'"
Iain Dale, broadcaster on LBC radio and blogger also chimed in. We discussed cycling safety on twitter and he followed up by writing a comment to me on this blog: "After 20 years of not cycling I now use a Boris bike several times a week and enjoy the experience very much. I think London has made huge strides in becoming much more friendly to cyclists, but clearly more can be done....I doubt whether any junction like [Elephant] can be made totaly safe, but you are right, those statistics speak for themselves and show that something must be done." "The only political point I would make is that sometimes it would be nice if people acknowledged that Boris Johnson has done far more to promote cycling in London than any other politician has ever done. You can't reverse 50 years of more or less ignoring cyclging in 3 years, but the introduction of the cycle hire scheme, the super highways and other lanes are surely things we can all welcome." Fair enough. Some of those may or may not have been Ken's ideas. But that's not what worries me at the moment. Road narrowing. In vogue among London councils. What worries me is that there is something deeply wrong going on at Transport for London. TfL has been warned again and again - in formal consultations, through informal means (three mass protests on Blackfriars Bridge with 2,500 people on bikes on the most recent ride, hundreds and hundreds of people writing to them), through votes in the London Assembly, through petitions from London Assembly Members - that its road policies are killing people unnecessarily. And yet it still seems plough on regardless. Whether that's junctions like this one pictured left (Oxford Circus) where the road space is narrowed, putting cyclists directly in harm's way (same goes for Piccadilly - a brand new scheme - or for Tottenham Court Road, which is about to be designed like this as well). Cycle route on cramped pedestrian crossing. Or whether that's places like Vauxhall gyratory pictured left. Believe it or not, the cycle route is through the pedestrian crossing. There's barely enough space for pedestrians between the barriers let alone people on bikes. And yet there's actually tonnes of spare space here. It's simply that Transport for London thinks all that space should be given to motor vehicles not to pedestrians or people on bikes. A lot of focus has fallen this week on Bow roundabout. 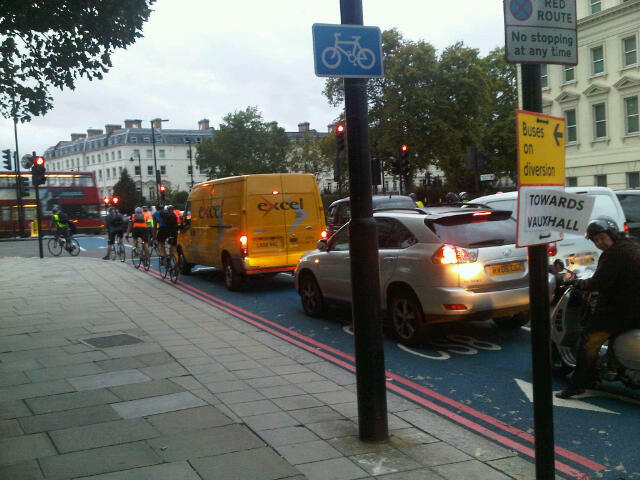 But the problems are not just at Bow roundabout. A few weeks ago, the focus was on Kings Cross - scene of multiple collisions that have killed cyclists over the last three years. A few weeks before that, the focus was at Elephant & Castle, where the Mayor is refusing a scheme he had earlier supported and that would civilise the area for pedestrians, tube passengers and cyclists. This is a place with one cyclist killed and 89 seriously injured between 2008 - 10. That simply isn't right. The same goes for Clapham Road (Super Highway 7), Elephant & Castle (Super Highway 7), Blackfriars Bridge (no Super Highway), the entire stretch of Super Highway 2, almost all of Super Highway 8 down to Wandsworth, except for the short stretch along the river. 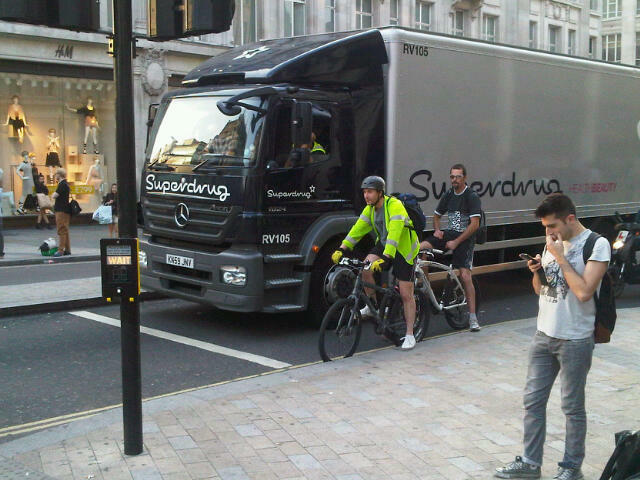 We've spent less than 0.03% a year of London's annual transport budget making London a safe place to cycle. And even then, much of that money has been blown on advertising campaigns that help no one rather than infrastructure. First requirement - Allocate more of London's road spending to include cycling. And second requirement - allocate it properly. Don't pass off utter crap like Super Highway 2 or like the plans for a new Tottenham Court Road as being about cycling. They're not. They're about trying to throw a few bits towards cycling while making life generally worse for motorists as well. Nearly 50% of road journeys in London by car are under two miles. It's time we gave people the option to look at their journey and think, 'yup, that looks safe enough, I might take the bike instead'. It's just a bicycle. Jenny Jones made this point: "I am an experienced cyclist who wants roads that are safe for a twelve year old to cycle on." The Cycle Super Highway to the Olympics is one that Transport for London thinks should be friendly for families who want to get to the Games. It's not. It's a bloody disgrace. But this ride will be family-friendly and safe for everyone if we get 1,000 of us to ride out there together. So that's the aim. 1,000 people to cycle to the Olympics. Together. Because it's too scary for most people to do it any other way. When I started this blog I said I would remain non party-political. And I hope I've managed that. This isn't about being anti-Boris. This is about asking him to tell Transport for London to make cycle routes that are safe enough for a 12 year old. Anything less is a failure in my book. Saturday March 17th. Tour du Danger 2. From central London to the Olympics. I hope we'll make 1,000 of us. But we may be more. I'm doing this for my sister, her kids and for the many, many people who have contacted me to say they think it's time London became a place for their kids to cycle again. More details soon from Cyclists in the City, from ibikelondon and from Kennington People on Bikes. With the full support of many of the marshalls and borough groups of the London Cycling Campaign who backed us for the ride last week. I will be joining this time, since I live in East London. Keep up the pressure! Excellent idea - I'm up for many more of these structured rides too - Critical Mass is just too unfocused to really feel you are doing anything other than running riot and annoying a few car drivers. remerson - watch this space for an additional ride we'll announce soon. But the big focus is reserved for the Olympics in March. In the interests of making it non-party political, and considering this ride will be taking place on March 17th, about 6 weeks away from the mayoral elections, we shouldn't just be pushing Boris but pushing ALL of the mayoral candidates about getting them to promise a better future for cycling whoever gets elected - I may have missed it bun Ken appears to have been pretty quiet about recent events, and so he needs as much pressure as Boris does. Very supportive. 17 March in diary. Ken has said that he will put Jenny Jones in charge of cycling..... I would like to know if he will also give her a suitable budget. I'm in, and I'll pull along as many others as I can. I'm in for any additional rides in the meantime too - this is too important a cause to ignore. I was chatting to a good friend on Sunday. Turns out a mate of his works for TFL's surface transport division. He was involved in planning the 'superhighways.' He doesn't cycle (and said that none of the team he worked with did), and told my friend that he didn't think they were safe 'at all.' He went on to say that as far as he knew, there was precious little heed paid to any of the advice supposedly received from cycling groups. I'm trying to meet him myself so I can pick his brains, but from what I hear, TFL were pretty half-hearted when it came to implementing the CSH's - which is pretty clear to those of us that use them everyday. Count me in too - I'm another Bow cycle-commuter who's fed up with the situation. "The blue cycle surfacing indicates that the lane is shared and reminds motorists that they will encounter cyclists, thereby improving cyclist safety." In other words, they admit that these routes aren't cycle lanes, are intended merely to indicate that cyclists may be seen - and reply entirely on motorists having a 'caring sharing' side to their characters. I never thought I would say the following about anything, but the Health & Safety Executive should make and enforce their recommendations. Why haven't they? It looks like the HSE's agenda is not to make things safer, but to just waste money (like most government departments). Enough is enough. I hope the ride in March (if not sooner) will get massive support from all the Borough groups and everyone who cycles in London. The recent Blackfriars Bridge protest was inspiring, but I hope this will be much bigger. I live in Cambridge (and am a member of the cycling campaign there)- if it doesn't clash with other engagements and there's trains running, I'm up for joining this. For the truly adventurous, anyone fancy a second one, along the "Olympic" car-only lanes, leaving central London about when all the dignitaries should be leaving their expensive hotels to get to the opening ceremony?